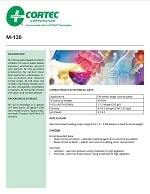 Description: M-120 is a water based corrosion inhibitor for use in water based epoxies, urethanes, acrylics and alkyds. M-120 provides protection for carbon steel and aluminum, eliminates in-can corrosion and reduces scribe creep. Application: Recommended loading levels range from 1.0 – 3.0% based on total formula weight. Package: M-120 is available in 5 gallon (19 liter) pails, 55 gallon (208 liter) metal drums, liquid totes, and bulk. FEATURED IN: Additive Enhances Corrosion Protection Featured in NED Magazine! FEATURED IN: Cortec M-120 Additive Enhances Corrosion Protection of Water-Based Coatings Featured in Canadian Metalworking Magazine! FEATURED IN: Additive from Cortec Featured in PCI Magazine! FEATURED IN: New Cortec® Additive Enhances Corrosion Protection of Water-Based Coatings Systems Featured in IPCM Magazine! FEATURED IN: Cortec M-120 Additive Enhances Corrosion Protection of Water-Based Coatings Featured in Fabricator Magazine! FEATURED IN: Enhanced Corrosion Protection of Water-Based Coatings Systems Featured in Electronics Specifier Magazine! FEATURED IN: New Cortec® Additive Enhances Corrosion Protection of Water-Based Coatings Systems!